Bu otel için şu anda herhangi bir rezervasyon kabul edilmemiştir. Lutfen asagidaki detaylara bakiniz. 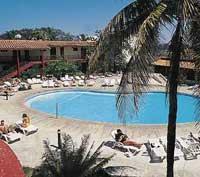 "The Oasis" is a warm, friendly hotel located only a few meters from the beach. In spite of it’s Creole-tiled roof, shared areas and other elements of its design that bear the stamp of colonial Cuban architecture, it is a modern and functional hotel with amenities that make it unique in this the most international resort in Cuba. It is the ideal place for water sports too, such as diving, kayak, sailing, etc. And has a special treat for tennis lovers. Two restaurants, 3 bars, snack bar, pizza place, disco, shop, swimming pool, 5 tennis courts with facilities for night games, motorcycles for rent, 6-person jacuzzi, gymnasium, sauna, massage, money exchange desk, safe deposit box, tourist desk, parking lot and taxis, shuttle bus service throughout the beach area every hour, this is one complete hotel experience! Hotel Islazul Oasis will be closed for rennovation works until 31st October 2018. Housing 147 air conditioned rooms with private bathroom and satellite television.